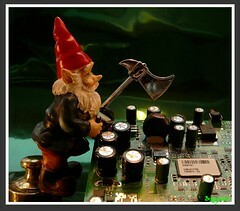 Have you ever felt like this little guy, wanting to "fix" things? After years and years of promises and science fiction and tons of money spent on artificial intelligence research (in which I participated), computers are still slow and not prone to learning from user behavior. It's particularly annoying when it doesn't learn from me yelling at it. I don't have the answer, but there is a tool that makes life much easier, and I had never thought of it in this way until I listened to a GTD Times podcast between David Allen and Buzz Bruggeman touting the wonders of ActiveWords in the context of helping get things done when you are attached to your computer. And, well, ActiveWords does help my computer get closer to understanding me. Of course, I have to teach it, but that's just fine. Once it knows me, it responds to me very nicely. I've installed ActiveWords on every computer I've had, since I first heard about it five or six years ago. And my word database ports pretty nicely. What is ActiveWords? In essence, it lets me keep my fingers on the keyboard and do most of the stuff I do on the computer. I have to do far fewer mouse actions (or mouse pad on the laptop), getting me to the thing I need as quickly as possible. I also find that my desktop is far cleaner: just a nice picture of my kids or some other attractive photo. ActiveWords are all fired by typing a keyword I create, followed by a semi-customizable action key. There are also a number of add-in's that extend the functionality to familiar applications or web services. Website you always visit? Just create a word that launches the browser and jumps there immediately. 'fbk' takes me to Facebook. 'pb' takes me to PeopleBrowsr. Document you reference a lot? Do the same. 'pwd' takes me to my long list of passwords and logins. Similarly, it is just as easy to have Word or Excel open with a favorite template, ready to go. Expense reports anyone? Or maybe there is a folder you visit all the time? 'dl' takes me to my downloads folder (already reverse-date-sorted), so I can check the recent downloads I've made. Frequently-used applications can be fired up this way too. 'sonos' opens my Sonos Desktop Controller. 'xl' gets me to Excel. 'paint' opens the old standby Paint program. I've got tons of these - it is so nice to not need to run through the Programs list to find these things. There is an add-in for Outlook that gives me quick access to my Contacts. Who was that guy named "buzz?" Type that name and I am taken right to Buzz Bruggeman's contact. No more switching to Outlook, then to the Contact list, then to attempt to find the name. If there are multiples, it gives me a list. Or if I can't quite remember a name but remember that they worked at XYZ Co., I can type the company name (or one word in the name) and get a list of everyone at that company. I've even set up shortcuts that automagically create email to people I write to often. 'mm' creates a message to my wife. 'm bill' starts a message to a colleague. Oh, and there are simple text substitutions too. All my signatures (I have a bunch) are ActiveWords that I insert when I need. Addresses, phone numbers, my Mileage Plus number... You get the idea. Anything I type regularly gets an ActiveWord, if I remember to do so. I really miss AW when I am using a different computer. Of course, ActiveWords isn't perfect and doesn't do everything. But there are a bunch of things I'd really like to be able to do. Maybe I can, and I just don't know it. Interface with PersonalBrain, my archiving tool. PersonalBrain is always running on my machine, but it is totally graphical and makes it difficult to try automating around via ActiveWords. It would be nice if the ActiveWords - Outlook integration would recognize nicknames, if they've been entered. An add-in for the Movable Type control panel would be superb. I've created a few shortcuts of my own to do common administrative things, but there are others that I could never figure out. For instance: take me to the page to edit the most recent entry.